Hundreds petition to reinstate ousted Pendleton police chief. 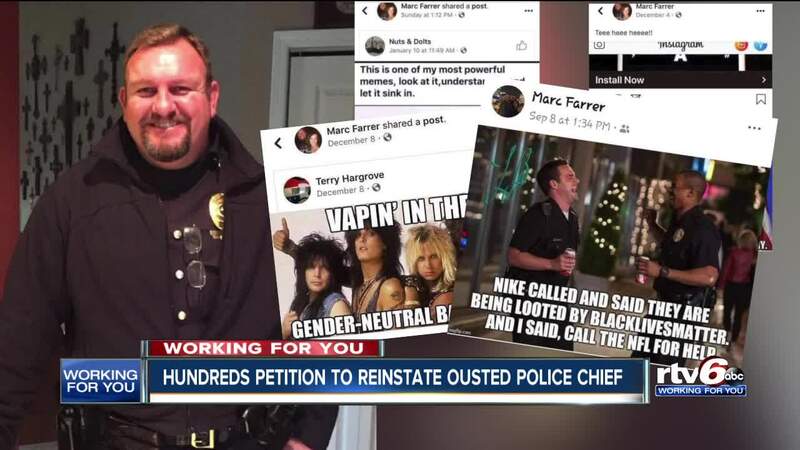 PENDLETON — A Pendleton police chief was ousted by the town council last month over offensive posts the chief allegedly shared on Facebook. Now, hundreds are signing a petition pushing to put him back on the job. Although some believe the town council is doing the right thing firing the chief, there's a vocal group of supporters that say they believe Marc Farrer was wrongfully terminated. Now, they're planning to march to town hall Saturday morning, ahead of his appeals hearing, calling for the chief to be reinstated. "He's always been very professional," Kara Kollros, a supporter of the ex-police chief, said. They've launched a petition supporting Farrer with more than 1,600 signatures. They put up signs and created a Facebook group. In a 3-2 vote last month, the town council moved to fire the chief over Facebook posts council members say compromise his ability to carry out his duties in a fair, impartial and nondiscriminatory manner. "I think they were more political to be quite honest," Eldridge said. The posts (pictured above), appear to mock Black Live Matter, people who are transgender and another links Islam with violence. According to Kollros, that does not reflect the person she once worked with at Elwood Police Department. "I've never heard him say anything racist, towards anyone, about anyone," she said. Some, do not see the issue the same way. Some are siding in favor of the town council's decision about the chief's online conduct. "I think it puts an entirely wrong image on this town," Dr. Begley, a Pendleton resident and town council supporter, said. "I hope that the council realizes who they represent. That's the town. The people don't want to see him go," Eldridge said. The chief does have the right to appeal the town council's decision to fire him. that hearing is set for this Saturday at Pendletion Town Hall.